At Northern Heating and Air, we evaluate your needs for any home heating project to determine the feasibility of installing Heating, Ventilation and Air Conditioning (HVAC) thermostats, and assess any HVAC thermostat repair issues. We also provide high quality, convenient remote access thermostats for homeowners in Glens Falls, Queensbury, Saratoga Springs, Clifton Park, and Lake George, NY. Remote access thermostats lend comfort and convenience to your home heating and cooling systems. A thermostat is a device for regulating the temperature of a heating and air conditioning system so that the temperature is maintained at a desired set temperature. The thermostat does this by controlling the flow of heat energy into or out of the system. That is, the thermostat switches heating or cooling devices on or off as needed to maintain the correct temperature. Unfortunately, with today’s heating and air conditioning needs, and the desire for energy conservation, many of the older styled thermostats simply do not provide the level of control you want and desire. Technology can be a wonderful thing, and this has never been more evident than with today’s current selection of connected devices for your home. Modern wi-fi thermostats connect to your existing home network and allow fingertip programming and adjustment control of your home’s heating and cooling equipment from almost any internet-connected mobile phone, pc, or tablet. Remote access thermostats are like taking your thermostat with you wherever you go. Your thermostat should be located away from the room’s cooling or heating vents or device, yet exposed to general airflow from the room(s) to be regulated. An open hallway may be most appropriate for a single zone system, where living rooms and bedrooms are operated as a single zone. If the hallway may be closed by doors from the regulated spaces then these should be left open when the system is in use. If the thermostat is too close to the source controlled, then the system will tend to “short cycle”, and numerous starts and stops can be annoying and in some cases shorten equipment life. A multiple zoned system can save considerable energy by regulating individual spaces, allowing unused rooms to vary in temperature by turning off the heating and cooling. Most thermostats are a low voltage wiring installation and involve anywhere from 2-10 wires, depending on your type of heating and cooling system. If your job requires a replacement or new installation, call your Northern Heating and Air professional to ensure the proper equipment and installation, as well as operation with your heating and cooling system. It is also a good idea to upgrade an old manual thermostat to a programmable thermostat to save energy and utility bill costs. This is especially true if you are replacing a central air conditioning or heating system. 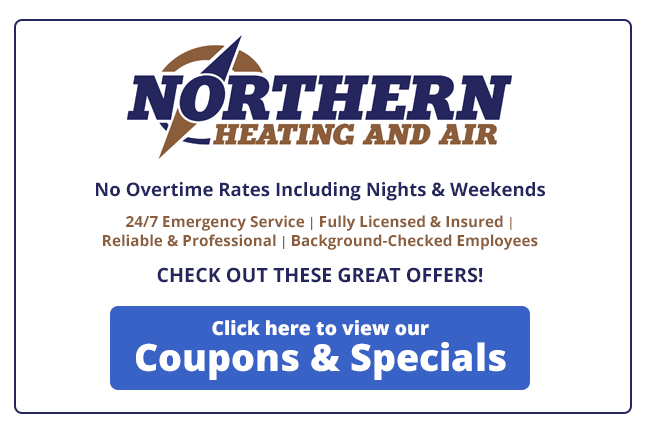 Contact a technician at Northern Heating and Air and schedule an appointment to ensure proper installation, instruction and repair for remote access thermostats in Glens Falls, Saratoga Springs, Lake George and Clifton Park NY. CALL 518-745-0401 TO SCHEDULE AN APPOINTMENT – OR – REQUEST AN APPOINTMENT NOW!